1) Photos. Frame and display a bunch. Put together some photo books. Organize iPhoto. Get rid of frames that are too twee or that I will never use. NOPE. They are still sitting there. 2) Storage. Organize storage spaces around the house so I can find things and be happier with what we have. 3) Client work – improve, not just maintain. Circle around to some past clients and make sure they are still doing well. Make a conscious decision to network and land some new clients. Dedicate some real professional development time. Shuffle off client things that no longer make sense. NOPE. But I didn’t crash and burn anyone either. 4) Exercise. The lack of it is getting stupid. 5) Get our financial house in order. It’s not totally off the rails, but it could be much better. One of my goals for 2016 was to do more creative things. 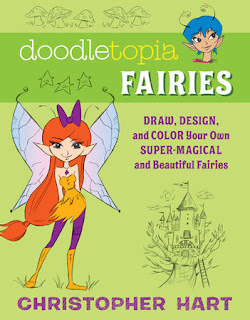 I was just about ready to chalk it up as a total fail when I came upon Doodletopia Fairies and decided to give it a try. I have to say, I was at first intimidated by it. "SURE it's easy" I groused as I paged through and saw perfect drawing on one side and the instructions on the other. I put it away for a day, thinking there was no way I would even get that far. But, on second look, it became a lot more manageable. The instructions are not overly demanding, leaving you a little space to experiment on your own. And though my first attends were not perfect, they were not bad either. I'm excited to spend some time over the winter holiday trying this with my 8-year-old daughter. In summary — just the right amount of hand-holding to keep you feeling engaged, without being too didactic on the final product. 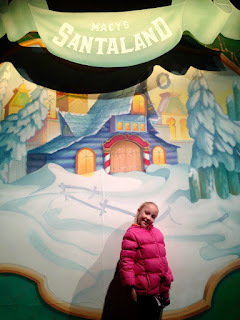 Yesterday was Beatrix's last day of school before winter break, so we decided to do some celebrating. First we headed over to Rosedale to see a free mini-performance of The Nutcracker by Out on a Limb Dance. I have a lot of respect for their program, which is greta dance and has kids of all sizes and shapes performing, and we love The Nutcracker. It made Beatrix really anxious to dance again. After that we wandered the mall a little, including checking out The Limited, which is closing (I feel like I lost my youth just saying that). The entire mall was actually really dead and sort of run-down; I don't know if we have outgrown malls, or if malls have changed with an online culture. But it was kind of depressing. Beatrix and I wanted to make something special for teacher and friend gifts, but were not sure what to do besides the usual food gifts/ But then inspiration struck — why not make seed bombs for people? A quick search on Pinterest gave us some great ideas. (Meanwhile, hero Patrick ran out on the snow to get some more seeds, since we realized that out seed packets were somehow empty and all we had were veggie seeds. Photo credits also to Patrick). 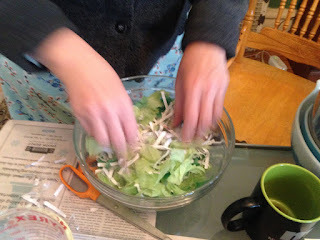 First, we tore colored tissue paper into small pieces, and mixed it with paper from the shredder to make a pulp (though we did have to pull out several parts that had had window envelopes). Beatrix thought tearing the paper was tedious, but stuck with it. The info we had called for making the paper mulch into shapes using cookie cutters and squeezing out the water. We learned quickly that this was harder than it looked, but paper towels helped. We also realized we could not use cookie cutter shapes that were too intricate. "2016 has been so bad it doesn't even deserve a December" I quipped as the calendar page turned. And then it mocked me even more by throwing even harder stuff at me — death and illness for those I care about, financial struggle, smaller issues like car problems that should be easier to get through but somehow are not. It's bone-chillingly cold, and I am tired and by the time I put Beatrix to bed at night I'm slogging along and can barely face the things I have to get done still that night. And by now it's "deep December." I always start feeling crummy and overwhelmed exactly on the 12th, and it takes me a day to remember "oh, that's the day your mom was admitted to the hospital for the last time." It's a dull, nagging pain that gets more acute every day until Christmas, and it's worse this year because it's been ten years now, and milestone days are hard. Ten years seems like a lifetime — in many ways it is. Ok, I have to admit that I first thought How to Talk To Your Cats About Gun Safety would be more of a coffee table book, like "Why Cats Paint" or something. Though what I thought the pictures would be of I am not sure. It turns out to be a funny little book that apparently stems out of an original zine of the same name. It's kind of grungy and cute and an amusing enough read. 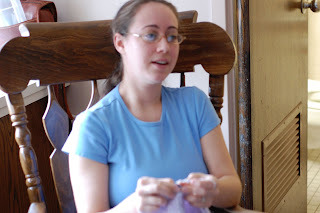 When I was about six months pregnant, I commented "I think we should have a doula." Eventually he agreed, though, that having an extra person around for Beatrix's birth would be a good thing. And the first time we met Vanessa, when we walked into Dunn Brothers to meet her and she was curled up with a 450-page book, we knew she was the right person for us. One of the best decisions we ever made). Over the next several weeks, we spent a lot of time together as we tried different techniques to turn stubborn Beatrix around from breech (it worked!) and come up with a birth plan that we felt good about and Abbott would not pooh-pooh. In the airport as we left London, I bought a soft, cozy cashmere cardigan that I have worn constantly since being home, wrapping in the memories of London. Paris is a city you visit; London is a city you live in. While we spent a week in Paris being tourists and seeing things, we spent a week in London simply being. We shopped in all the High Street stores in St. John's Wood near our flat. Beatrix visited Hamley's Toy Store, and was in heaven. We met friends in pubs, my friend Ben took us around the new building at Guildhall School of Music and Drama, Patrick's friend Matt flew down from Paisley for the day to join us.